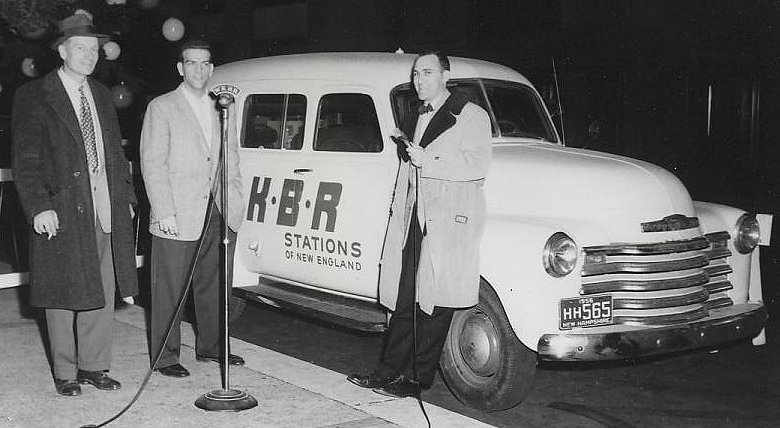 NHAB is curious what kind of station vehicles are being used these days. Whether you bought or traded, rented or leased, member stations are welcome to submit photos of their news cars, satellite trucks, mobile studios or promotional vans, past or present. 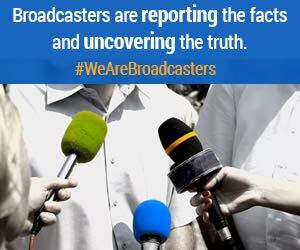 Please include a brief description. 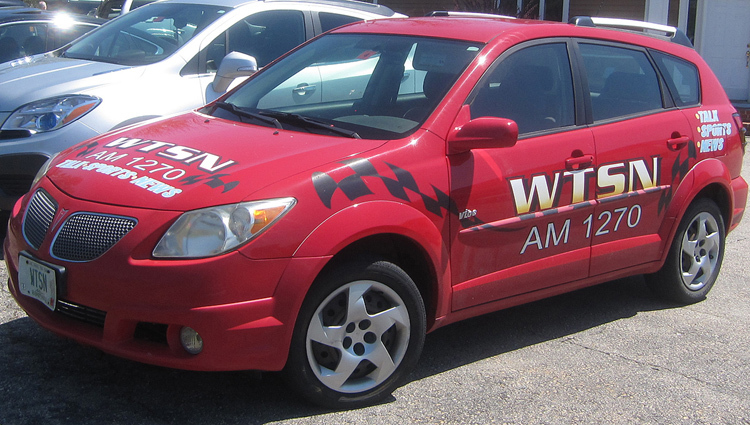 There’s no prize…just a chance to show off your station’s coolest, most-tricked-out wheels. 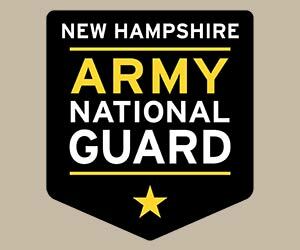 Send your submission to ed@nhab.org. 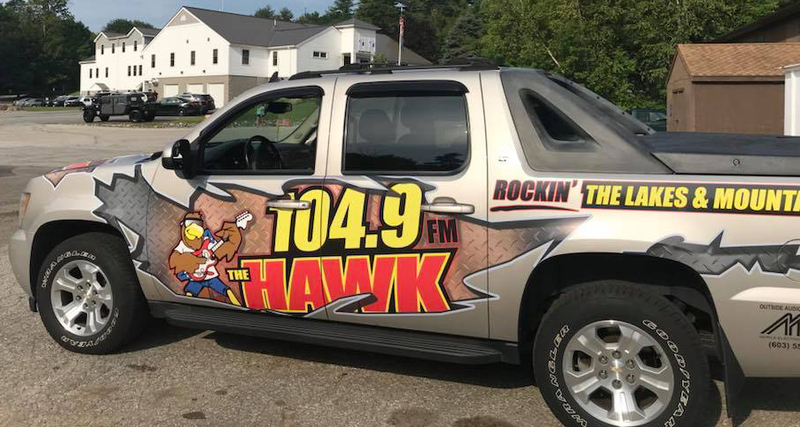 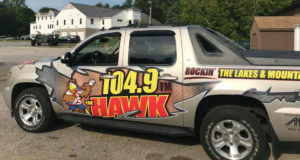 When this vehicle steams through the Lakes Region there’s no doubt it belongs to 104.9 The Hawk, @2018. 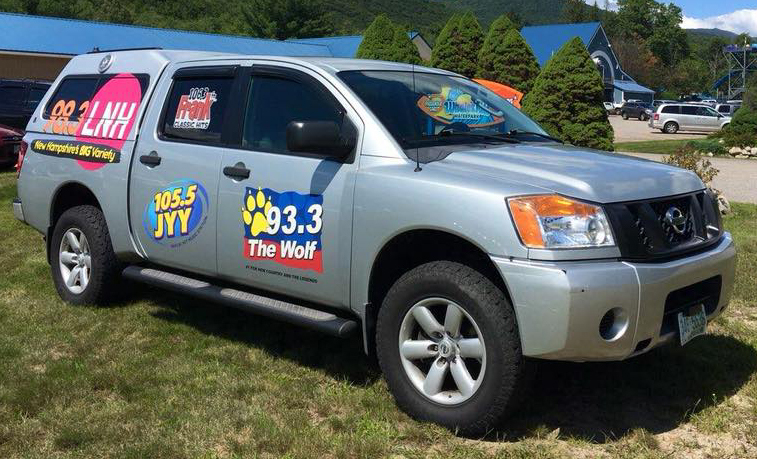 Multiple Binnie stations make use of this oversized pickup, @2018. Townsquare Media’s flagship NH station, WOKQ, shows off its remote van, @2016. 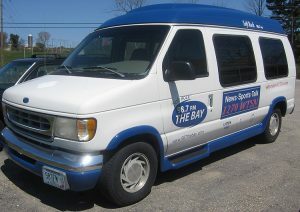 Townsquare sister stations, WSAK/WSHK “The Shark” have their own transportation. 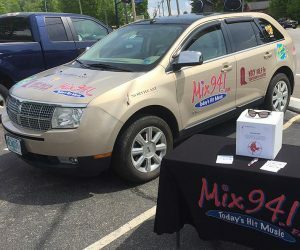 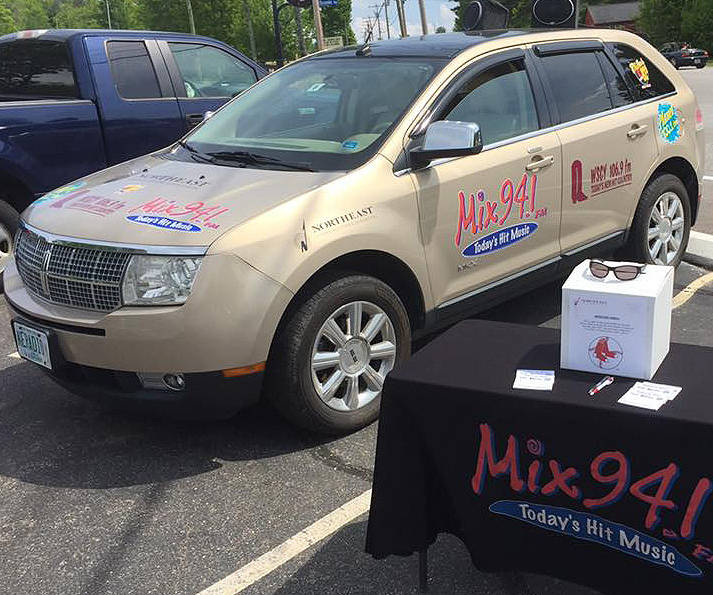 Northeast Communications uses this vehicle throughout the Lakes Region for WFTN (Mix 94.1), WSCY, and WPNH FM (Planet 100.1). 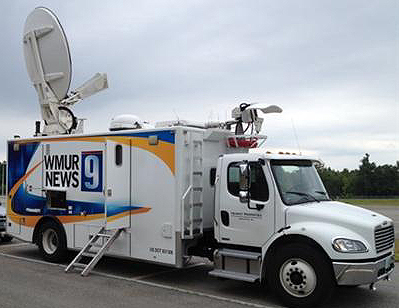 Two examples of wraps visible on WMUR Television remote vehicles, @January 2015. 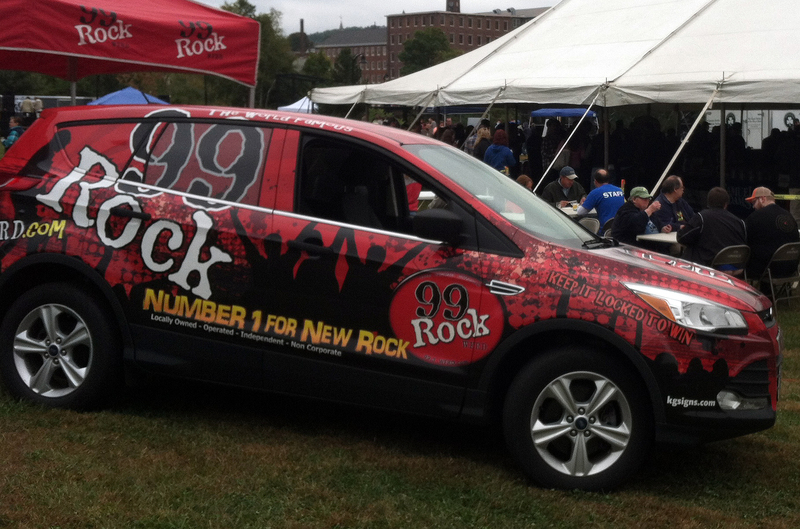 Dartmouth College has equipped student-run commercial station WFRD with a 2013 Ford Escape. 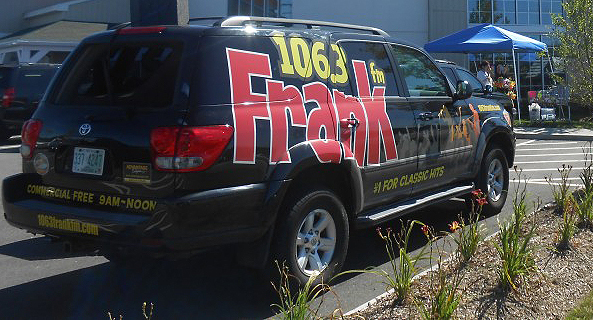 This shot shows the Street Team at the annual Claremont Brew Fest. 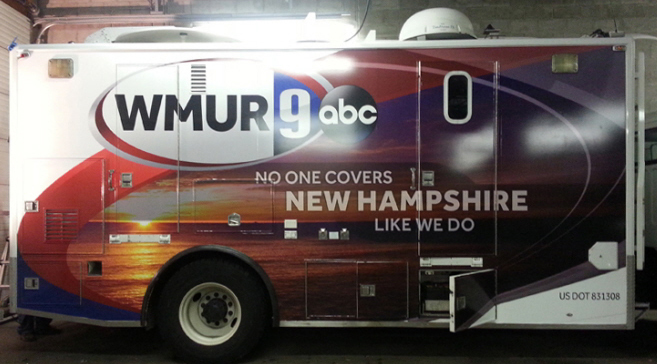 WMUR-TV satellite truck ready for action, July 2012. 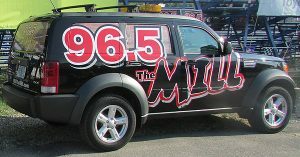 In Greater Manchester it’s not uncommon to see WMLL’s 2007 Dodge Nitro, especially visible at night when it’s yellow utility lights illuminate the skyline. 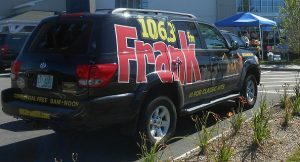 In Nashua, you’re likely to see FRANK FM’s vehicle doing remotes at places like WoofMeow Family Pet Center. 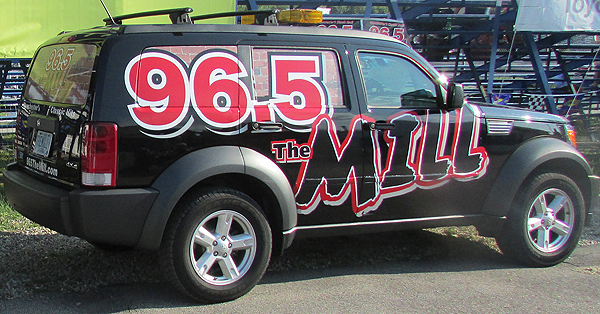 Garrison City Broadcasting operates these vehicles for their Dover combination: WTSN and WBYY-FM. 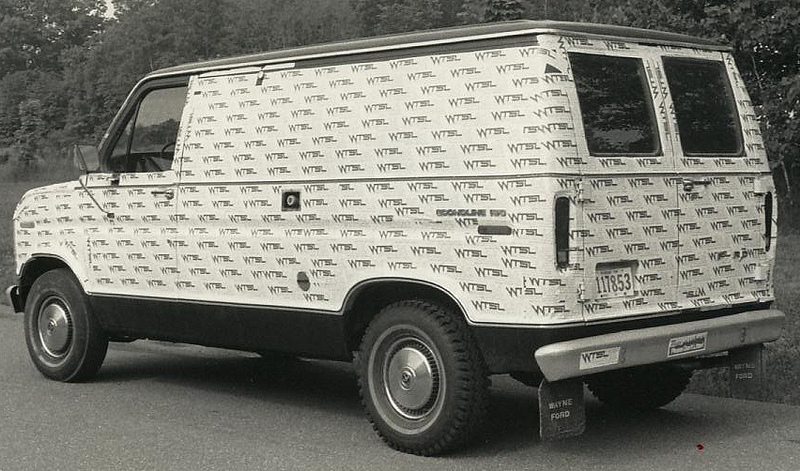 What was 12 feet tall, 20 feet long and attracted crowds wherever it went? 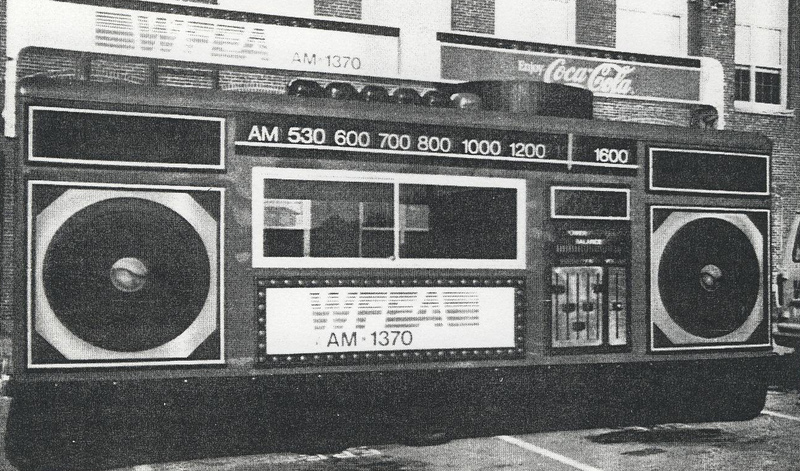 It was WFEA’s Super Roving Radio @1988. 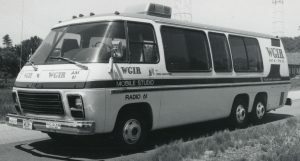 The original iteration was red but later it was painted baby blue and shared duties with sister station WZID. 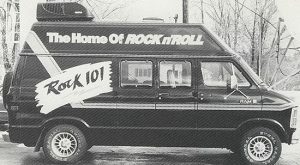 WGIR FM made waves in Manchester when it unveiled the promotional slogan, “the Best Damn Rock.” This Dodge Ram became known as the “Best Damn Van” around October 1987. Hanover, NH – recipe: 1 van, a couple of hundred bumper stickers; WTSL remote van @1985-86. WGIR Manchester completely renovated a GMC motorcoach as a fully equipped studio @1979. 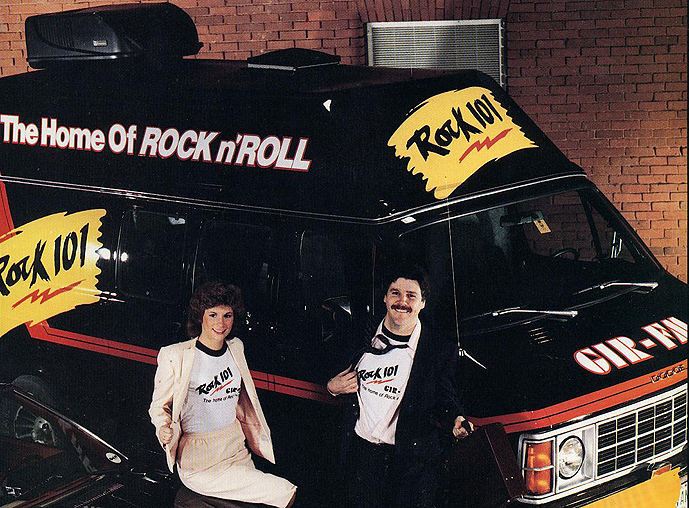 It’s original white paint job included changeable rear wheel covers and signs for AM/FM use. 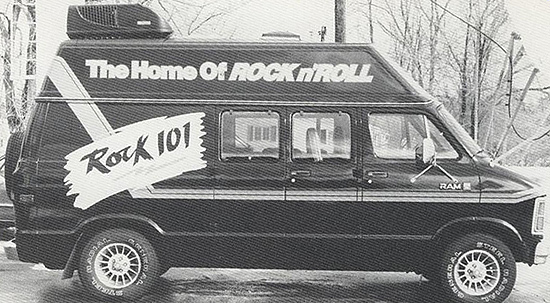 It was later repainted fire engine red. 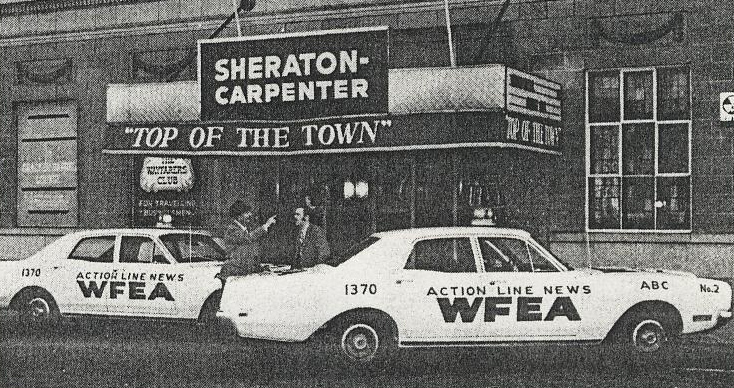 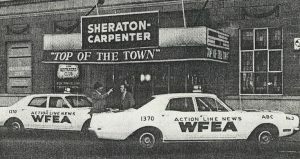 WFEA’s Action Line News cruisers in Manchester @1969. 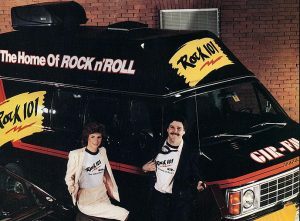 OK, only two cars, but each had a different number painted on the left and right front sides to give people an inflated perception of the fleet. Porta-Mobil (“an entirely new concept in two-way radio communications”) unit used at WOTW AM/FM in Nashua @1965. 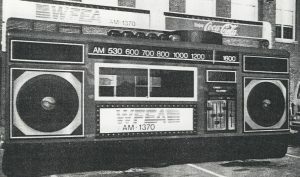 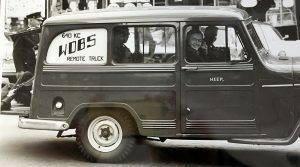 WOTW’s crosstown competitor had its own van in the mid 1960s. 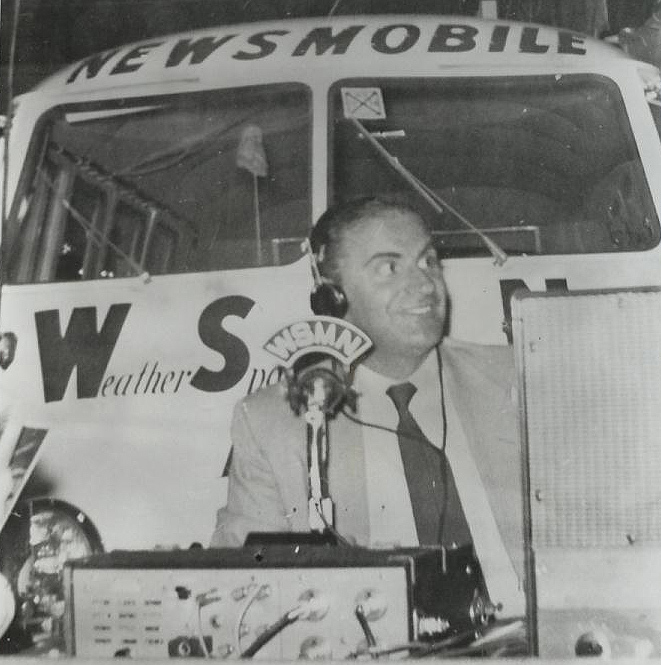 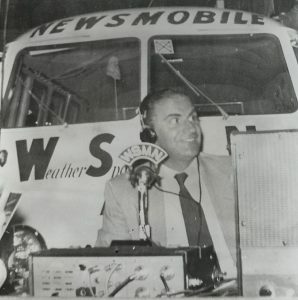 Frank Teas broadcasts from the WSMN Newsmobile. 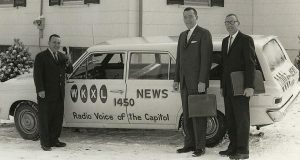 In Concord, news director Bob Lauze, owner Frank Estes and sales manager Ed Gray with the WKXL station wagon, @1964. 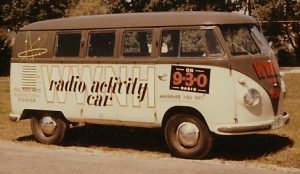 Over in Rochester, the former WWNH called its Volkswagen bus the radio activity car @1960-61. 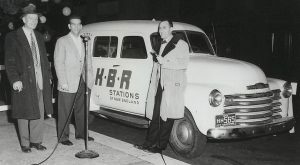 Dec. 6, 1956 – WKBR”s Al Davis, Bill Varney & Bill Morrissey broadcast live from New York City’s Rockefeller Plaza for the lighting of a Christmas tree provided by a family from Whitefield, NH. 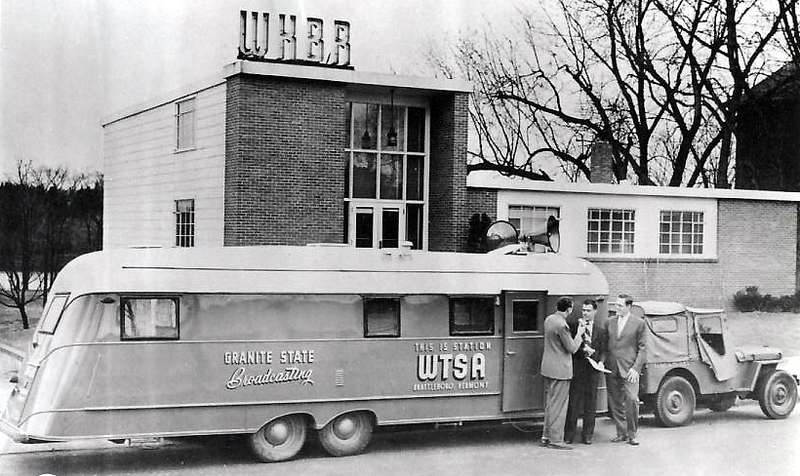 Love this shot of Granite State Broadcasting’s remote trailer pulling away from WKBR Manchester in April 1950. 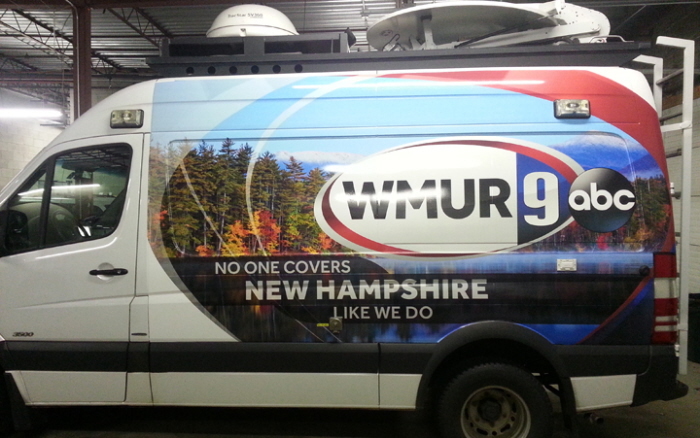 It was headed to Brattleboro, VT where it would be used to transmit until WTSA’s new building was ready. 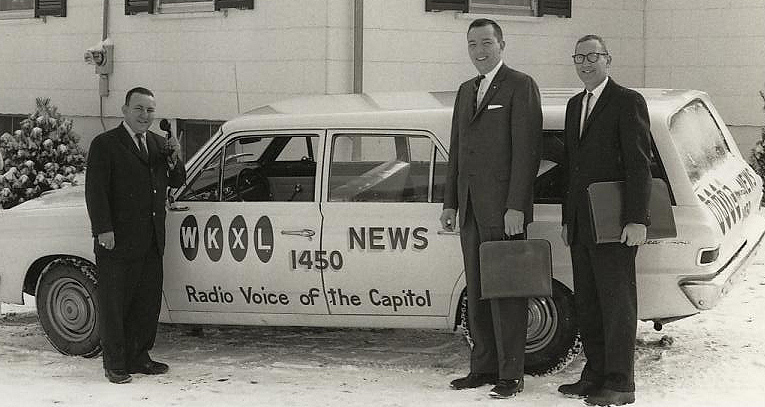 Late that year it would head north to Hanover, NH as Granite State began building WTSL AM/FM. 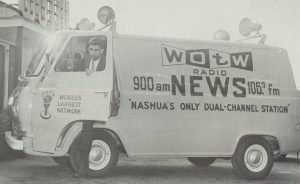 From 1941-43 Dartmouth College operated carrier-current WDBS at the lower end of the AM dial. The World War II surplus Jeep Heep was often used for remote broadcasts and public appearances. 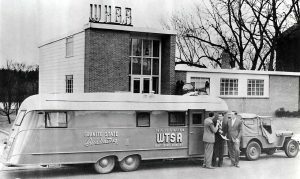 Incidentally, WDBS was reinstated after the war and was later replaced by WDCR.